December 10–14, 2018: Ye Feng attended the AGU Fall Meeting in Washington, D.C. On Monday, Feng, a post-doctoral researcher, gave an oral presentation at the Near-surface Advances in Exploration Geophysics session titled, Shallow Marine High-Resolution 3D Seismics for Above-Zone CO2 Monitoring: A Case Study in Offshore Japan. Tip Meckel also joined the latter half of the week. Read about the Tomakomai study here. December 14, 2018: Katherine Romanak was interviewed by the Texas Standard and broadcast on Texas public radio for a story on the Conference of the Parties to the UNFCCC (COP24) and what governments, businesses, and people can do about the climate. Listen to the interview. December 7, 2018: Five GCCC researchers—Tip Meckel, Ramón Treviño, Susan Hovorka, Katherine Romanak, and Alexander Sun—were recognized at the Bureau of Economic Geology’s 2018 Rainmakers’ Dinner. Researchers who generated at least $400K in funding this year were recognized. December 6, 2018: In collaboration with IEAGHG, CCSA, Bellona, and the International CCS Knowledge Centre, GCCC has secured the only official Side Event on CCS at the 24th Conference of the Parties to the UNFCCC (COP24) in Katowice Poland—a panel titled “Carbon Capture and Storage (CCS) for decarbonising industry in developed and developing countries,” in which Katherine Romanak spoke. You can view a recording of the panel here. December 3-4: Susan Hovorka presented at the Carbon Management Workshop of the CO2 and ROZ Conference Week in Midland, Texas and attended the session on 45Q credits. 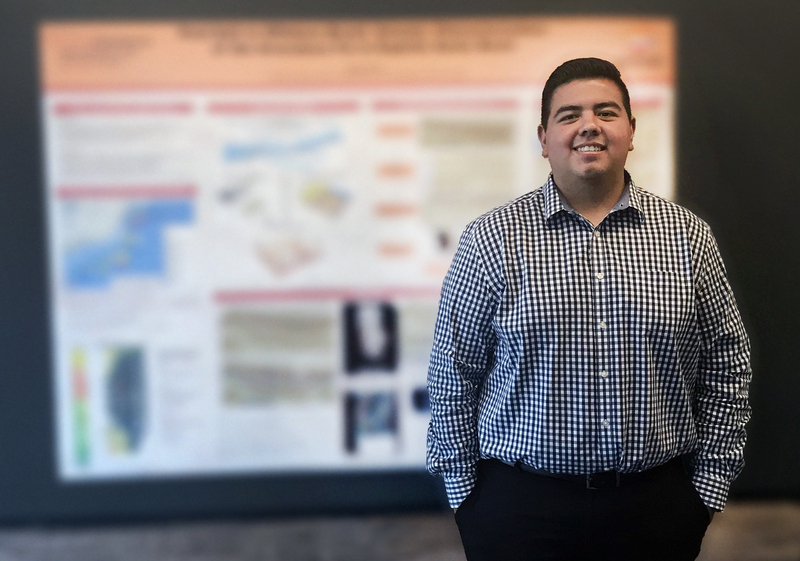 November 30, 2018: GCCC master’s student Izaak Ruiz received an offer from Repsol to join their industry immersive master’s program. The program starts in September 2019 and will last for 11 months in Mostoles, Spain after which Ruiz will be relocated to their Woodlands location. Ruiz got the offer after interning with them last summer and is expected to graduate in May 2019. After interning with Repsol this past summer, Izaak Ruiz received an offer to join their master's program near Madrid, Spain. 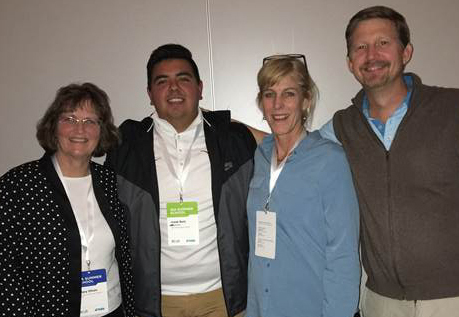 November 26-30: Susan Hovorka participated in the Society of Petroleum Engineers (SPE) interactive forum on CCUS as an organizing committee member. She developed a new technical game that allows participants to experiment with developing a business model to link sources, sinks, and policy options. The "game" was successful in engaging participants. The board game like model that Susan Hovorka developed helps a variety of stakeholders to conceptualize business models based on source, sink, and policy options. 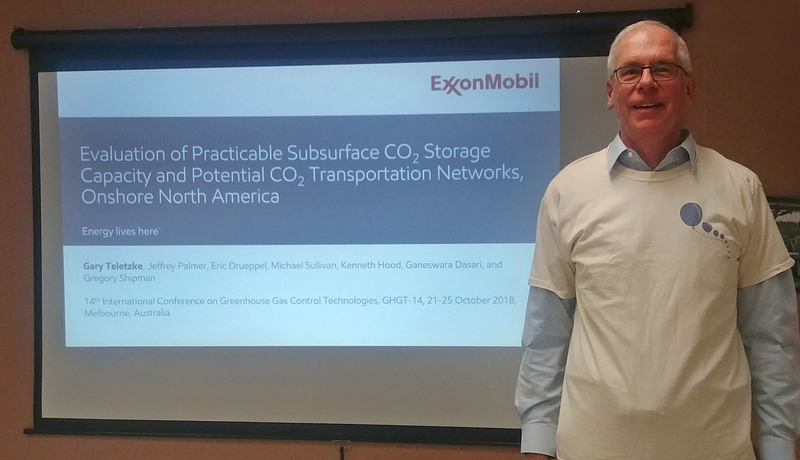 November 16, 2018: Gary Teletzke, senior technical advisor for enhanced oil recovery at ExxonMobil Upstream Research, gave a talk to the GCCC and had lunch with several GCCC students and post-docs after his BEG featured seminar, “CO2 in the subsurface – from EOR to storage”. Gary Teletzke gave a presentation to GCCC for those unable to attend this year's GHGT-14 conference. November 14-15, 2018: Susan Hovorka attended the MRCSP and Offshore Storage Meetings in Annapolis, Maryland. November 12, 2018: Ray McKaskle and Darshan Sachde from Trimeric Corporation joined GCCC during the weekly GCCC staff meeting. Sachde gave a presentation on Trimeric’s past and future work in CCUS surface infrastructure. We look forward to our collaboration on the GoMCarb project. 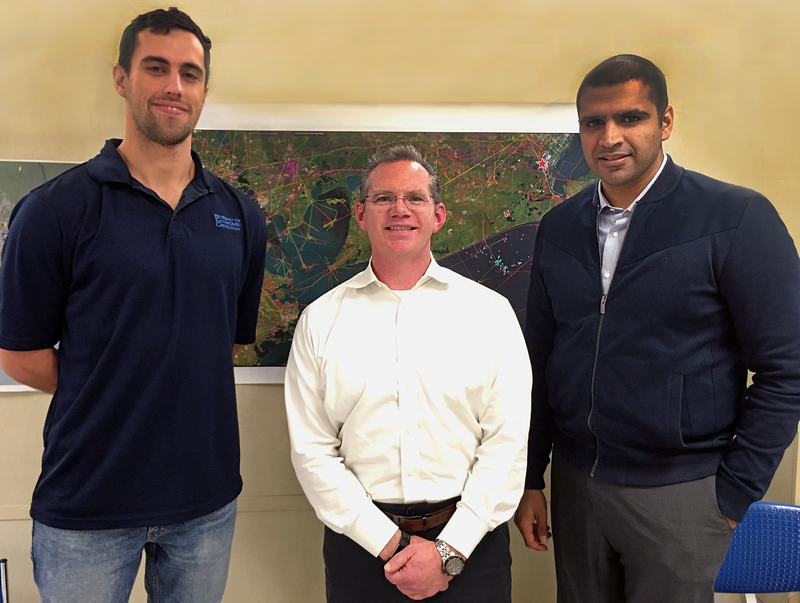 Peter Tutton of GCCC with Ray McKaskle and Darshan Sachde from Trimeric Corporation. Trimeric has been a collaborator on several GCCC projects. November 9, 2018: Susan Hovorka gave a seminar at the Bureau of Economic Geology titled “Global Status of Carbon Capture and Storage as a Greenhouse Gas Mitigation Measure”. Watch it here. 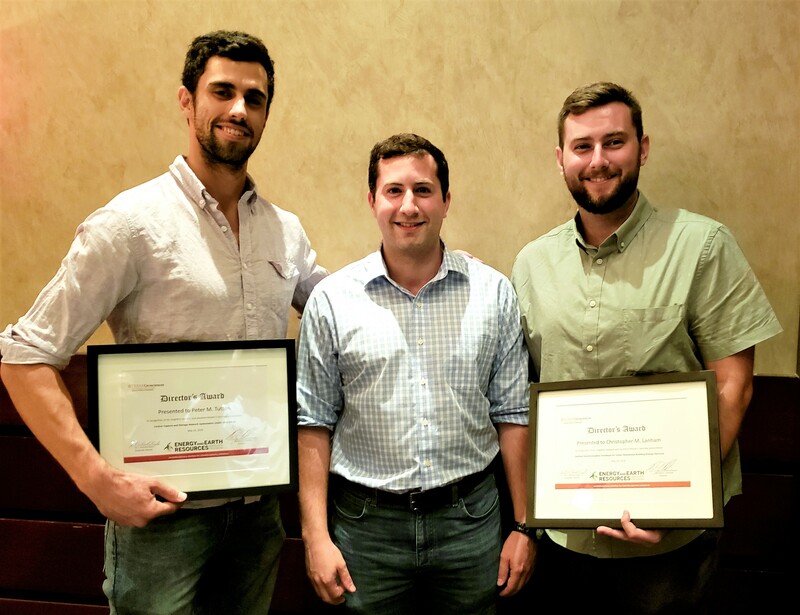 November 4–7, 2018: Tip Meckel and Ramón Treviño were presented the 2018 John C. Frye Memorial Award in Environmental Geology at the Geological Society of America annual meeting and at the Association of American State Geologists mid-year meeting for the report they co-edited titled “Geological CO2 Sequestration Atlas of Miocene Strata, Offshore Texas State Waters”. 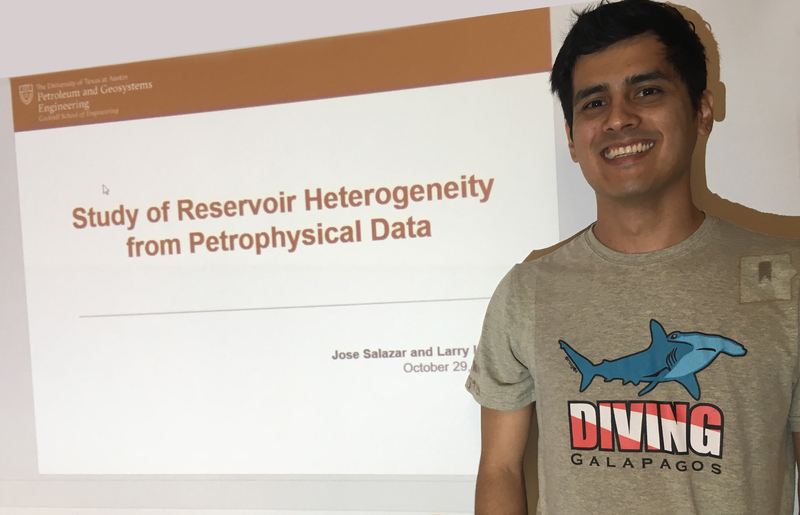 October 29, 2018: Jose Salazar, Petroleum & Geosystems Engineering graduate student supervised by Larry Lake, gave a presentation on reservoir heterogeneity at the weekly GCCC staff meeting. Salazar hopes in the future to apply machine-learning to his data to identify fractures. October 23, 2018: Susan Hovorka was presented the Greenman Award—widely considered the most prestigious award presented to a researcher in carbon capture and storage—at GHGT-14 in recognition of her outstanding contributions to the development of greenhouse gas technologies. October 22, 2018: The advisory committee of our current long-term offshore partnership, GoMCarb, met for the third time since the project started in April. The meeting was held in person at GHGT-14 in Melbourne, Australia and other members joined by webcast. Curt Oldenburg of Lawrence Berkeley National Laboratory gave a technical presentation on well blowouts. 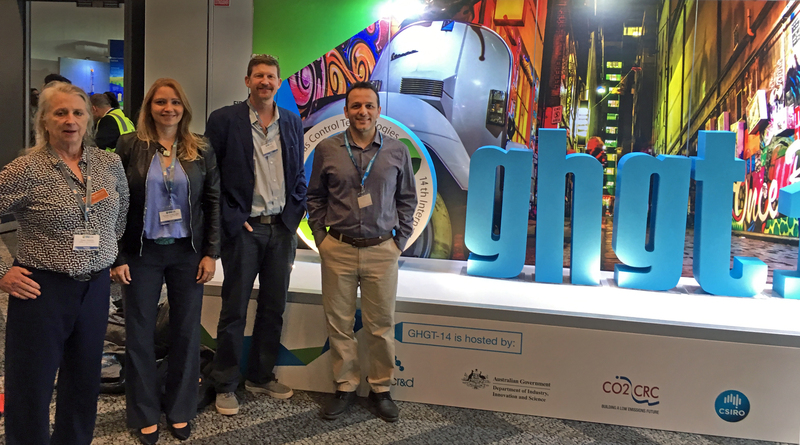 October 21–26, 2018: 6 GCCC researchers—Susan Hovorka, Katherine Romanak, Vanessa Nuñez-López, Ramón Gil-Egui, Seyyed Hosseini, and Tip Meckel—traveled to Melbourne, Australia to attend and present at GHGT-14, the 14th annual Greenhouse Gas Control Technologies conference, one of the most well-known international conferences on mitigation technologies with a major focus on carbon capture and storage. October 19, 2018: One of GCCC’s current graduate research assistants, Reynaldy Fifariz, successfully defended his Ph.D. dissertation. His dissertation research deciphered controls on Oligocene-Miocene carbonate shelf evolution, offshore of East Java, Indonesia. Fifariz is currently working on a GCCC project characterizing CO2 storage sites characterization and regional earth modeling using subsurface data from Texas state waters. 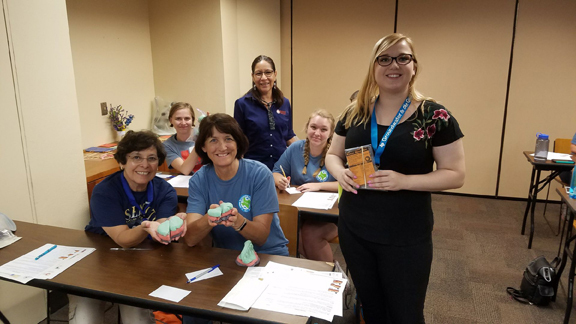 October 19, 2018: Six GCCC graduate students, researchers and post-docs celebrated national Earth Science Week by encouraging middle-school students to pursue a science career. 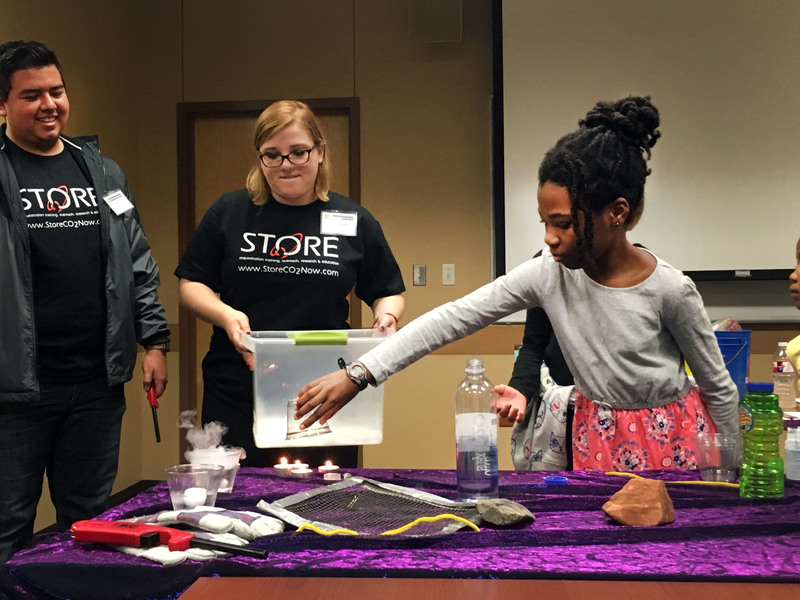 By using bubbles, dry ice, candles, and marble jars, outreach-ers demonstrated hands-on climate and carbon concepts to about 100 Austin-area students. Teachers can download the digital lesson plan for their own classrooms. Is CO2 flammable? Students capture and pour CO2 from dry ice over candles to extinguish them. September 28, 2018: There was a great turnout at the 6th Annual Bureau Research Symposium hosted by the Bureau of Economic Geology. Several GCCC members presented posters and short “Nano Talks”. 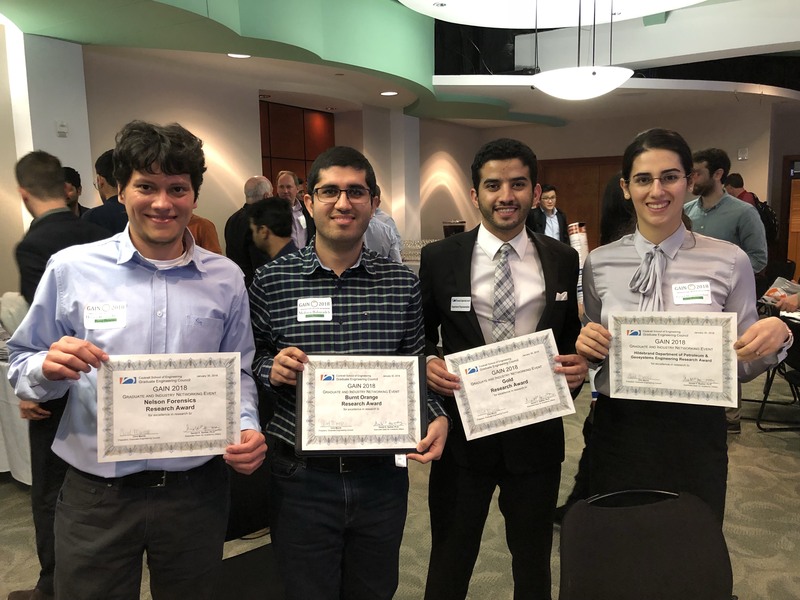 By popular vote, Pooneh Hosseininoosheri won best poster for her presentation, “CO2-EOR/Storage: How Black Turns to Green?”, exploring how oil recovery can become more environmentally friendly by selecting an optimal CO2 injection method. September 24, 2018: Software developed in collaboration with GCCC is featured in the Department of Energy’s latest Carbon Storage Newsletter. The Python-based web application called Leakage Assessment and Cost Estimation (PyLACE) was developed to help quantify financial risks associated with potential geologic carbon sequestration site leakage. PyLACE automates metamodel creation, knowledge sharing, and online collaboration to build confidence in industry decision making. Alexander Sun and Hoonyoung Jeong were lead authors on the paper. Jeong’s paper on pressure-based monitoring network design was also featured. 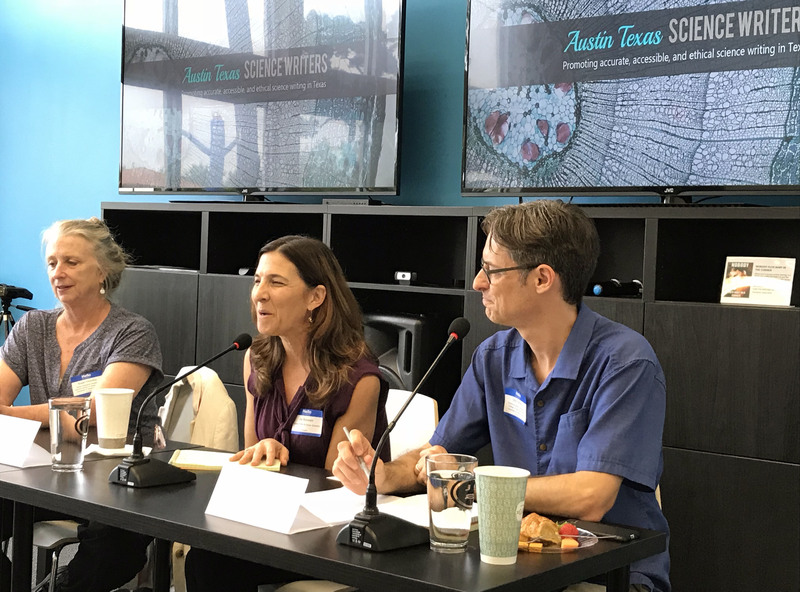 September 22, 2018: As a part of ongoing outreach, Susan Hovorka presented on a panel aimed to build public trust in science media coverage at a workshop called Bridging the Space between the Lab and the Press. Hovorka had the opportunity to ask the participants about their knowledge of carbon storage and reporting on the topic. September 20–21, 2018: Vanessa Nuñez-López and Susan Hovorka presented via webinar at the 5th North American Energy Ministers Trilateral Meeting for carbon capture, utilization, and storage in the U.S., Mexico, and Canada. Hovorka presented on a panel exploring academic opportunities in CCS in North America and Nuñez presented on carbon life cycle assessment (LCA) of CO2-EOR (enhanced oil recovery) for net carbon negative oil. September 20–21, 2018: GCCC postdoctoral fellow Sahar Bakhshian won best poster award at the 2018 TACC Symposium for Texas Researchers (TACCSTER) for her poster titled, “Development of a parallel pore-scale fluid flow simulator with application to geological storage of CO2”. Read the TACC news article highlighting the study. 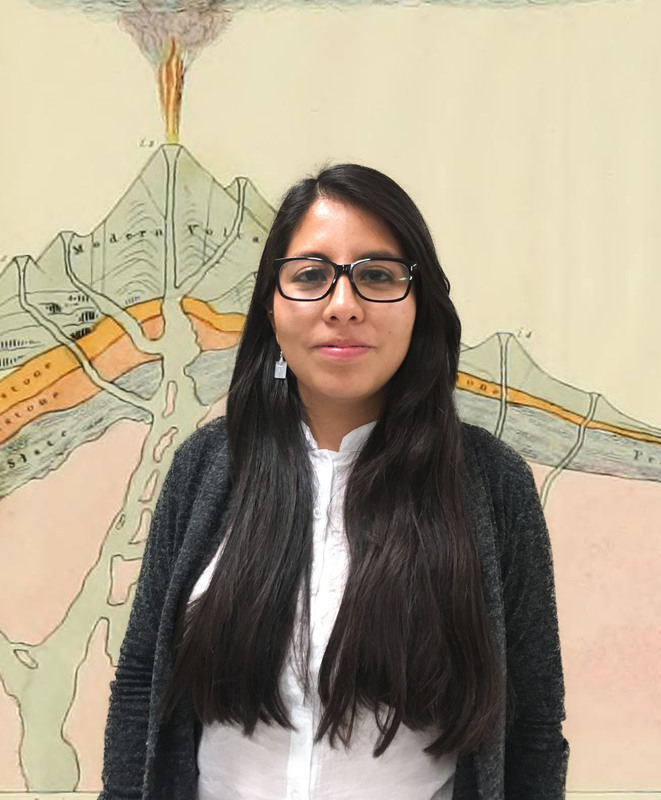 September 11, 2018: During the weekly staff meeting, GCCC visiting scholar Tania Huerta of the National Autonomous University of Mexico (UNAM) presented her research on inversion methods for well log interpretation, using data from the Rabasa oil field. Tania will be supervised by GCCC primary researcher Vanessa Nuñez-López during the 2018 fall semester. The GCCC proudly welcomes Tania and her collaboration with Mexico's Ministry of Energy. September 10, 2018: A chapter authored by Susan Hovorka and Jiemin Lu was published today. 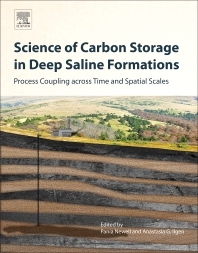 The chapter, “Field Observations of Geochemical Response to CO2 Injection at the Reservoir Scale”, is part of a book published by Elsevier and edited by Pania Newell and Anastasia Ilgen titled, Science of Carbon Storage in Deep Saline Formations: Process Coupling across Time and Spatial Scales. 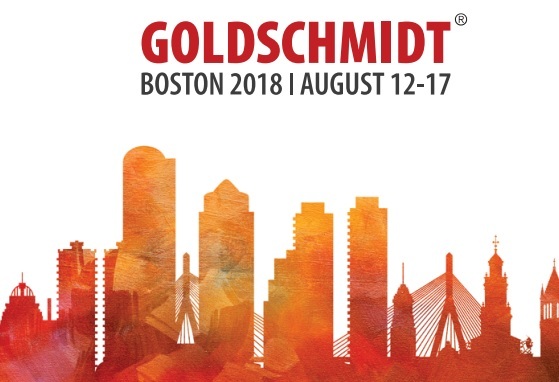 August 16, 2018: Susan Hovorka presented an invited talk “Roles of Tracers in Assuring Storage of Carbon Dioxide” at the Goldschmidt 2018 geochemistry conference in Boston, Massachusetts. August 13–16, 2018: Several Bureau of Economic Geology researchers presented at the U.S. Department of Energy/NETL Carbon Storage and Oil and Natural Gas Technologies Review Meeting in Pittsburgh, including Susan Hovorka, Ramon Treviño, Tip Meckel, Ramon Gil, and Alexander Sun of GCCC. 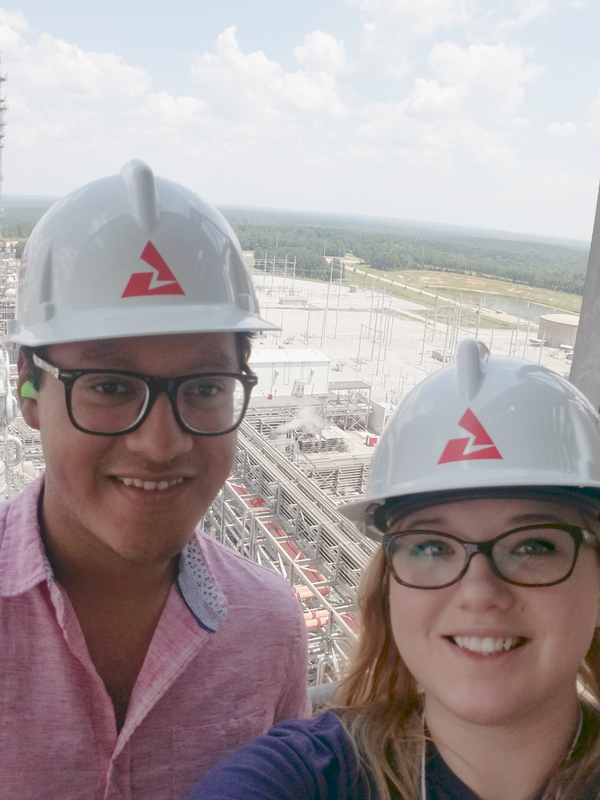 July 22-28, 2018: Sarah Prentice and Omar Ramirez attended the prestigious RECS CCS Summer School held in Birmingham, Alabama. RECS is an intensive CCUS education and training program. RECS has been recognized by the National Academy of Sciences as a key program in building the CCUS workforce to tackle carbon storage. Omar Ramirez and Sarah Prentice attend RECS 2018. July 4, 2018: During a recent visit to the Equinor research office in Trondheim, Tip Meckel met with Philip Ringrose and others in the CO2 group to discuss future research ideas. As part of the visit, Tip also met with Allard Martinius, a researcher at Equinor and also a full professor at TU Delft. Dr. Martinius has a long history of studying sedimentary architectures, so it was a pleasure to meet him at the famous 'wall' of sedimentary relief peels of tidal bar deposits that he was instrumental in bringing to Equinor's office in Trondheim (see photo). After summarizing recent related research conducted at GCCC, further discussions included overlapping interests in deltaic architectures (see photo of Delft3D model), sediment compaction, and flow simulation in realistic depositional architectures at many scales. It was a real honor to spend a morning with Dr. Martinius and future collaborations are planned to further develop our understanding of CO2 saturations in complex depositional facies and architectures. Allard Martinius and Tip Meckel. June 28, 2018: Izaak Ruiz presented "Should CCS be mandatory in developed countries?" at the IEAGHG 2018 Summer School. His portion of the presentation focused on how technically feasible it is for developed countries to implement CCS by examining data on CO2 emissions, fossil fuel consumption outlook to 2050, and storage potential. Izaak Ruiz presenting at the IEAGHG 2018 Summer School. The judges of the presentations from left to right: Tip Meckel (GCCC), Erik Gjernes (Gassnova), Norm Sakuta (PTRC), John Kaldi (CO2/University of Adelaide), Tim Dixon (IEAGHG), & Brian Allison (BEIS). 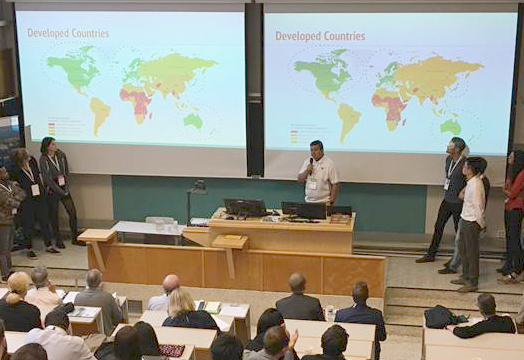 June 24-29, 2018: Katherine Romanak, Tip Meckel, Hilary Olson, and master’s student, Izaak Ruiz, traveled to Trondheim, Norway for the 12th IEAGHG International Carbon Capture and Storage (CCS) Summer School hosted by the Norwegian CCS Research Centre (NCCS). The summer school trains international researchers of all backgrounds (engineers to economists) in every aspect of the CCS value chain via a series of expert presentations, discussion groups, and team projects. Ruiz was one of sixty students chosen to participate in the highly competitive program. 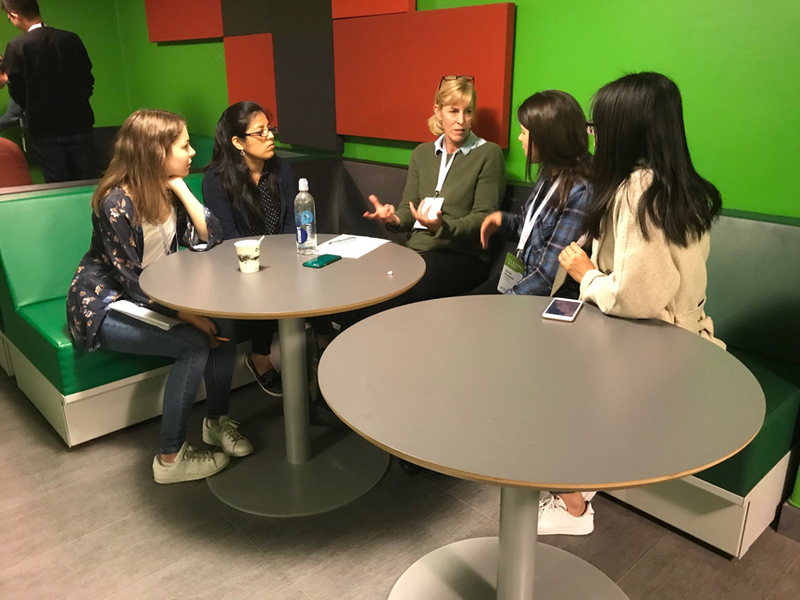 Romanak, Meckel and Olson served as expert mentors for the students, helping them with group projects throughout the week aimed at answering in-depth important questions currently relevant to CCS. Katherine Romanak delivered two presentations detailing the environmental impacts of storage and near surface monitoring. Katherine also hosted the GCCC’s attribution game called “Portrait of an Anomaly” developed by Susan Hovorka to incite participants to consider the cost and value-effectiveness of monitoring and think about what key drivers are required to deliver an optimum outcome for a storage project. IEAGHG Summer School Classroom in Trondheim, Norway. Katherine Romanak mentoring young women at the IEAGHG Summer School. 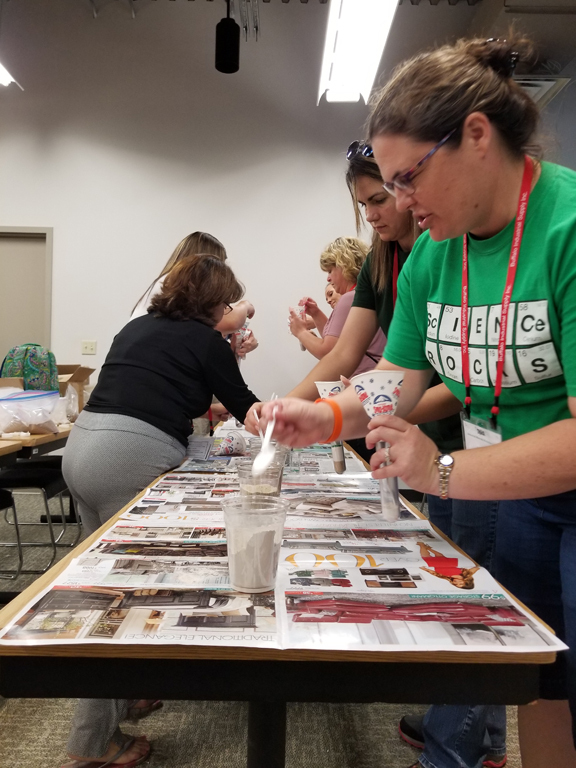 June 26, 2018: Sarah Prentice assisted in the Industrial Minerals Educator Workshop. Sarah took the visiting group on tours of the core storage site and TACC and distributed 30 GCCC carbon lesson plans to teachers interested in educating their students about CO2. June 24, 2018: Sarah Prentice and Omar Ramirez have been selected to attend the prestigious RECS CCS Summer School held in Birmingham, Alabama, July 22, 2018. RECS is an intensive CCUS education and training program. RECS has been recognized by the National Academy of Sciences as a key program in building the CCUS workforce to tackle carbon storage. June 17, 2018: The GCCC hosted a delegation for SINOPEC to disscuss CCUS. Sun Zhibin, Huang Jinshan, Song Xin, Wang Guisheng, and Jin Yue stopped in Austin as part of their global study tour. SINOPEC now has experience with CO2 EOR in five fields. Seyyed Hossieni presented modeling for CO2 EOR; Pooneh Hosseininoosheri presented CO2 EOR case studies and trapping quantification; Vanessa Nunez presented carbon balance for EOR projects; Peter Tutton presented source sink matching, case study and optimization with uncertainty; and Susan Hovorka presented experience with containment and environmental monitoring. 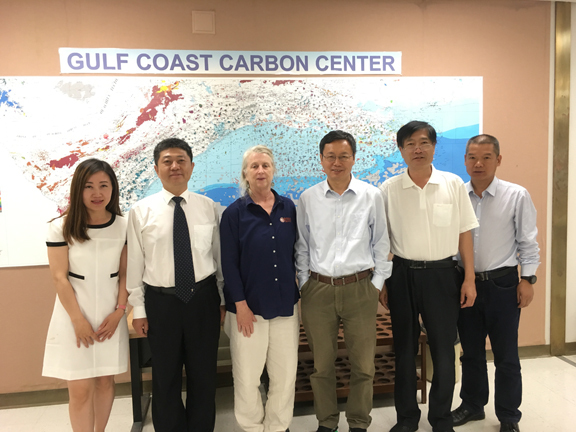 SINOPEC visits the GCCC to discuss CCUS. June 13, 2018: Susan Hovorka presented “Status of CCS and CCUS – progress has been made” at a workshop of the National Association of State Energy Officials (NASEO) that Eddie Trevino of the Texas Comptroller’s office, State Energy Conservation office hosted in Houston, Texas. 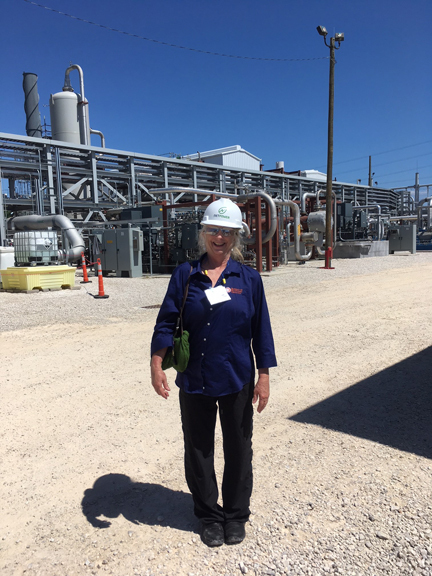 Susan Hovorka also visited the novel Net Power pilot plant in La Porte, Texas, on the workshop field trip. 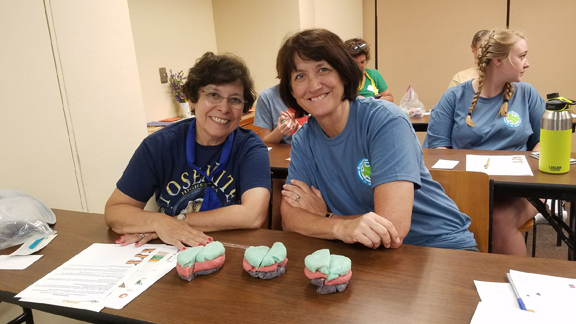 June 12, 2018: Sarah Prentice and Linda McCall presented a water science activity to K-12 teachers as part of the Groundwater to the Gulf Summer Institute at the Ladybird Johnson Wildflower Center. Linda McCall and Sarah Prentice conducting a demonstration with Central Texas educators. Linda McCall teaching a water science activity to a local teacher. 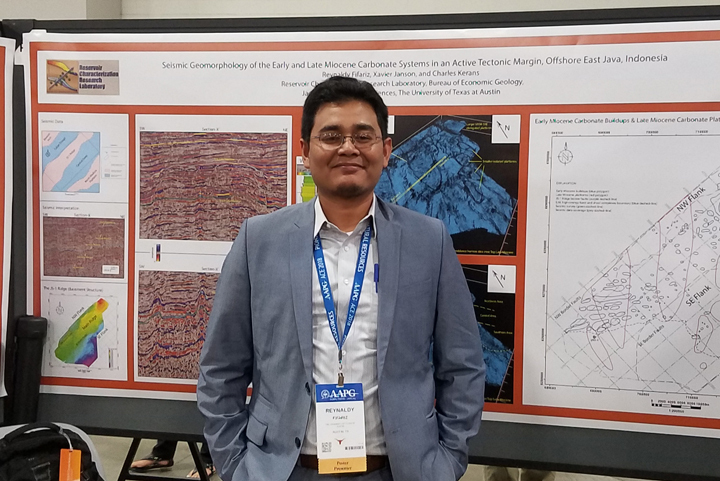 May 20-23, 2018: Reynaldy Fifariz presented a poster at the AAPG 2018 ACE (Annual Convention and Exhibition) in Salt Lake City, Utah. His poster, “Seismic Geomorphology of the Early and Late Miocene Carbonate Systems in an Active Tectonic Margin, Offshore East Java, Indonesia,” explores his dissertation research about the Oligocene-Miocene carbonate systems in offshore East Java, Indonesia. By utilizing 3D seismic data in order to describe and interpret the seismic geomorphology, he was able to investigate controls on the carbonate systems development in an active tectonic setting through the Miocene. He is co-supervised by Dr. Xavier Janson and Dr. Charles Kerans in the RCRL, BEG. 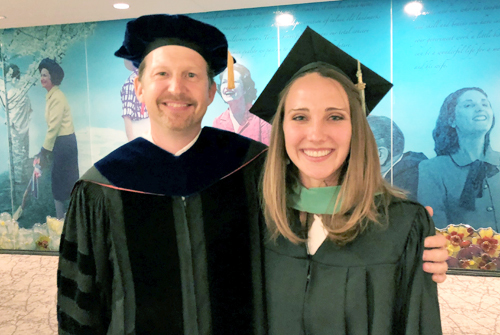 May 19, 2018: Congratulations to Peter Tutton and Emily Beckham who recently completed master’s theses in the Jackson School of Geosciences and graduated Saturday. Peter finished his M.S. in Energy and Earth Resources under the supervision of Dr. Ben Leibowicz and Dr. Susan Hovorka. His thesis examined optimal selection of sources, reservoirs and transportation routes given uncertainty in future CCS demand. Peter will avoid the gloomy British weather for the next few months by working with the Gulf Coast Carbon Center, Bureau of Economic Geology. He will continue to inventory carbon sources and carry out source-sink matching. Emily finished her M.S. in Geological Sciences under the supervision of Dr. Tip Meckel investigating the relationship between CO2 migration and deltaic stratigraphy. This involved the integration of geologic modeling, fieldwork, and Gulf of Mexico reservoir characterization. 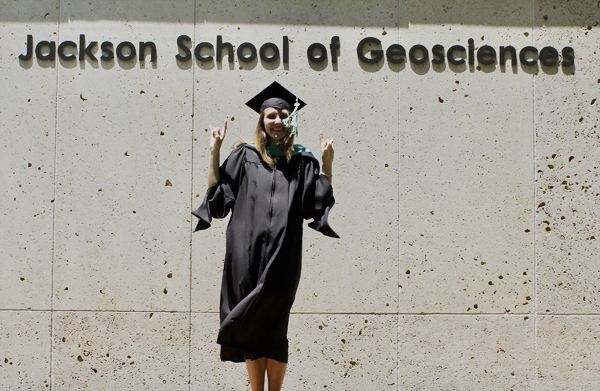 Her thesis was title "CO2 Storage in Deltaic Environments of Deposition: Integration of 3-Dimensional Modeling, Outcrop Analysis, and Subsurface Application". She starts work in fall 2018 with ExxonMobil as an Exploration Geologist. May 19, 2018: Peter Tutton received the EER Director’s Award in recognition of his insightful research and excellent Master’s presentation. 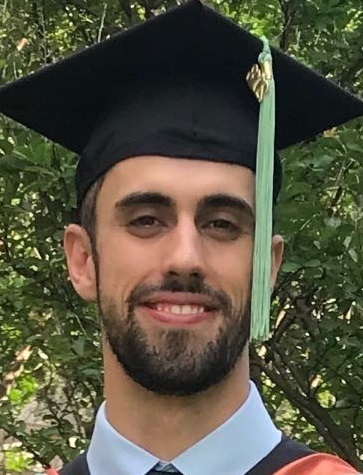 His thesis, Carbon Capture and Storage Network Optimization Under Uncertainty, was co-supervised by Dr. Ben Leibowicz and Dr. Susan Hovorka. Tip Meckel presents his p-cable work at Tomakomai. 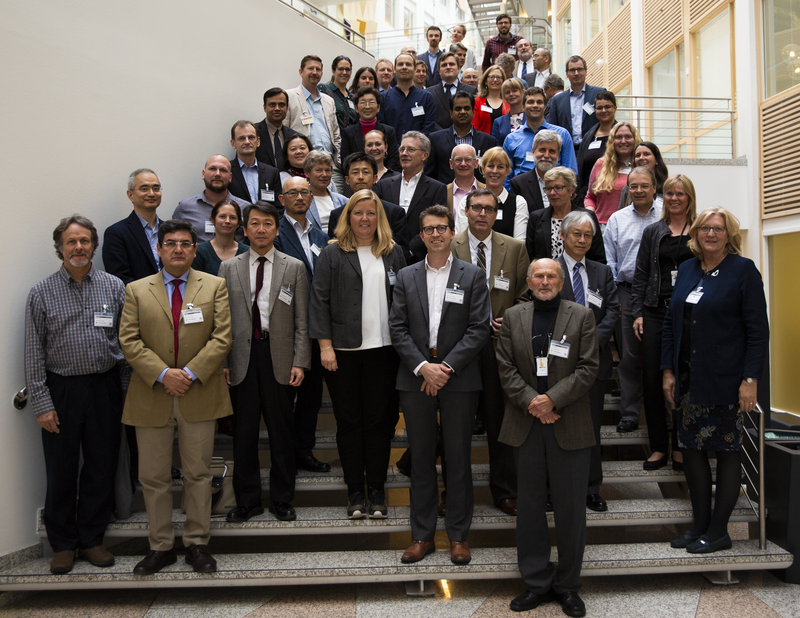 May 3-4, 2018: The 3rd International Workshop on Offshore CO2 Geological Storage was held in Oslo, Norway organized by the Bureau of Economic Geology (BEG) in partnership with IEAGHG and hosted by the Research Council of Norway. Additional support was provided from the South African National Energy Development Institute (SANEDI) and the Carbon Sequestration Leadership Forum (CSLF). Sponsorship was also provided by Statoil and the Norwegian Ministry of Petroleum and Energy. 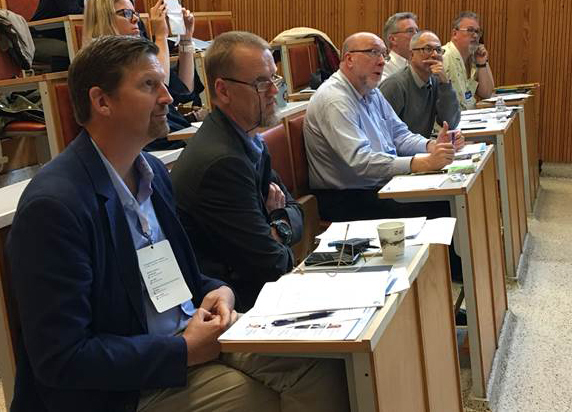 Steve Winberg, U.S. Assistant Secretary for Fossil Energy, and Torgeir Knudsen, Norwegian Ministry of Petroleum and Energy were in attendance and gave introductions to begin the workshop. Katherine Romanak co-chaired the conference with Chair Tim Dixon (IEAGHG) and presented Welcome and Scene-setting: How to ‘Learn from our learnings’ to remind attendees of the overall objectives of the workshop: to share the knowledge of those who are doing offshore storage with those who want to do and to work towards an international collaboration on an offshore storage project that will serve many nations. Romanak also chaired the Monitoring offshore CO2 storage/EOR session, which highlighted important topics such as seismic monitoring, seafloor/environmental monitoring, and leakage detection. Tip Meckel presented his technical research on the shallow seismic (p-cable) at Tomakomai, and storage resource assessment of the Gulf of Mexico. Other key topics discussed at the workshop included CCS for hydrogen value chain opportunities including offshore, including how the new 45Q tax rules might stimulate CCS projects in the USA, infrastructure, project updates, standards, regulatory frameworks such as the London Protocol, and public funding lessons including how CCS might be supported through the Green Climate Fund. The workshop ended with a brainstorming session on how to collaborate on an offshore project and conclusions and recommendations. Participants at the offshore workshop had the opportunity to visit the Klemetsrud waste-to-energy plant in Oslo, one of the proposed facilities for CO2 capture for the Norwegian Northern Lights project including offshore CCS. The offshore workshop was held in conjunction with the US/Norway Bilateral meeting aimed at identifying emerging areas of common interest between the two countries for future CCS research and development. Tip Meckel presented on the newly formed GoMCARB partnership lead by the BEG, focused on the Gulf of Mexico. The meeting included an update on the CO2 data share project, micro-seismic monitoring at Decatur, tools and hardware for offshore storage, NRAP for offshore and R&D co-operative projects. Initiatives such as ACT (Accelerating CCS Technologies), NCCS (the Norwegian CCS Centre), and ECCSEL (European CCS Laboratory Infrastructure) were also highlighted and discussed. The 3rd International Workshop on Offshore CCS attendees. March 22, 2018: GCCC graduate research assistant Izaak Ruiz has been accepted to the IEAGHG Summer School for CCS hosted by the Norwegian CCS Research Centre that takes place the week commencing the 25th June 2018 in Trondheim. IEAGHG’s Summer Schools are the only CCS education program to have a truly international focus. 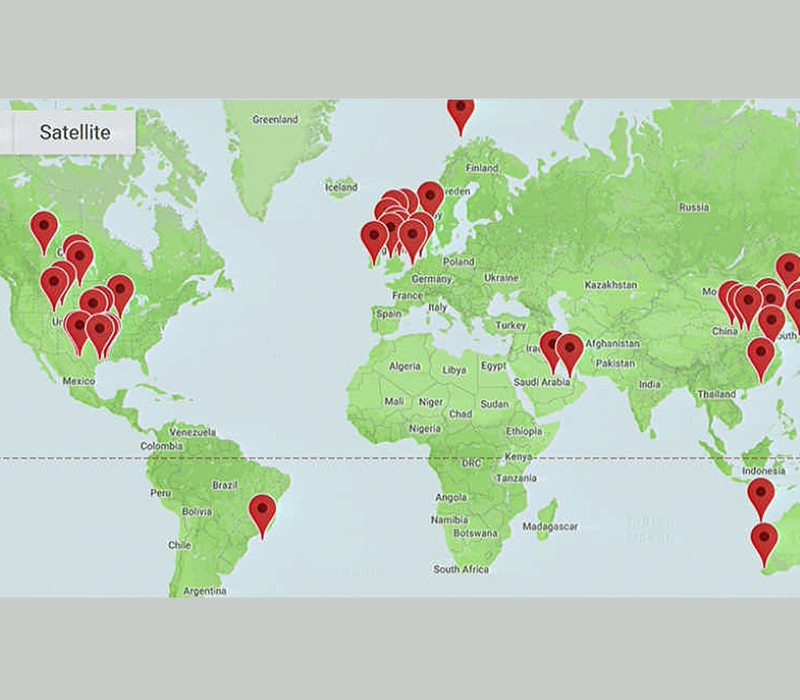 With the location moving around the world, the program has now taken place in over 7 countries covering Europe, Australia, Asia and North America. The Summer School is a great opportunity for networking and informal discussion with a range of experts attending (over 20 from both industry and research) who are all world-leading scientists in a wide range of fields. February 28 - March 1, 2018: Vanessa Nuñez-López attended ACI's 10th Carbon Dioxide Utilization Summit in Tampa, Florida, to present "The Carbon Balance Evolution of CO2-EOR: an Opportunity for Net-Carbon-Negative-Oil." Carbon dioxide enhanced oil recovery (CO2-EOR) enhances oil production by injecting CO2 into depleted oil reserves to displace residual oil toward production wells in a solvent/miscible process for extraction. Often this injected CO2 has been sourced from natural CO2 accumulations. Recently, projects have emerged that use anthopogenic CO2 captured from industrial facilities. In this presentation, Vanessa Nuñez-López answered the question as to whether CO2-EOR represents a valid option for greenhouse gas emission reduction. The debate has centered around whether or not the injected and stored volume of CO2 counters the emissions associated with the processes throughout the entire value chain. 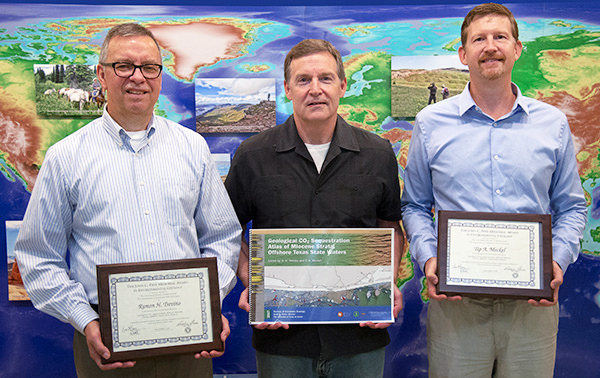 The GCCC carried out a DOE-NETL funded study titled "Carbon Life Cycle Analysis of CO2-EOR for Net Carbon Negative Oil (NCNO) Classification" to examine the question and found that CO2-EOR not only reduced greenhouse gas emissions but also provided valuable information to those seeking tax credits for carbon dioxide sequestration. 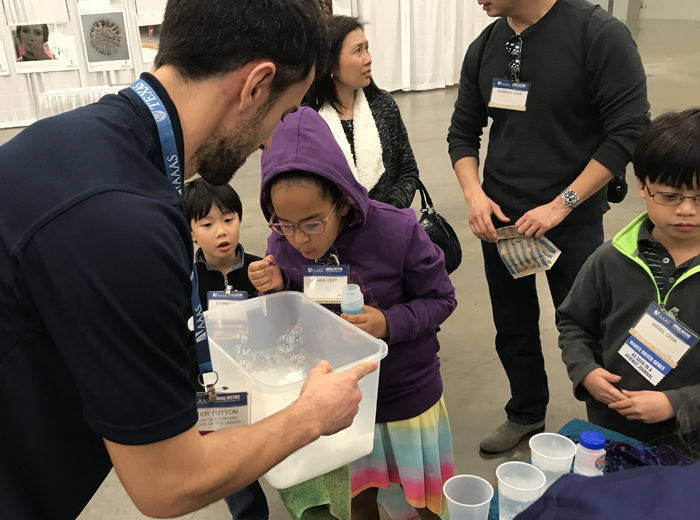 February 18, 2018: The Gulf Coast Carbon Center attended Family Days at the American Association for the Advancement of Science (AAAS) annual conference held in Austin, Texas. 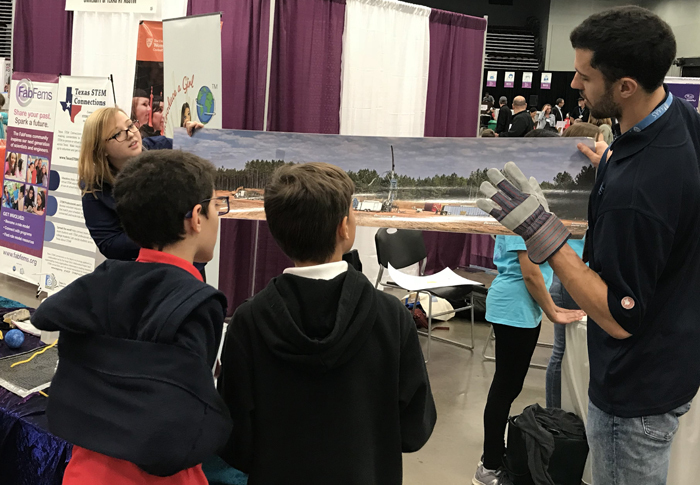 Two graduate students, Sarah Prentice and Peter Tutton, presented an interactive activity to educate children and their families about what CO2 is, why it's relevant to them and their everyday lives, and what we can do to reduce the CO2 in the atmosphere. February 12, 2018: Susan Hovorka gave a guest lecture and demo to 21 high school teachers of JSG’s OnRamps Dual Enrollment Earth, Wind, and Fire course at the University of Texas at Austin. 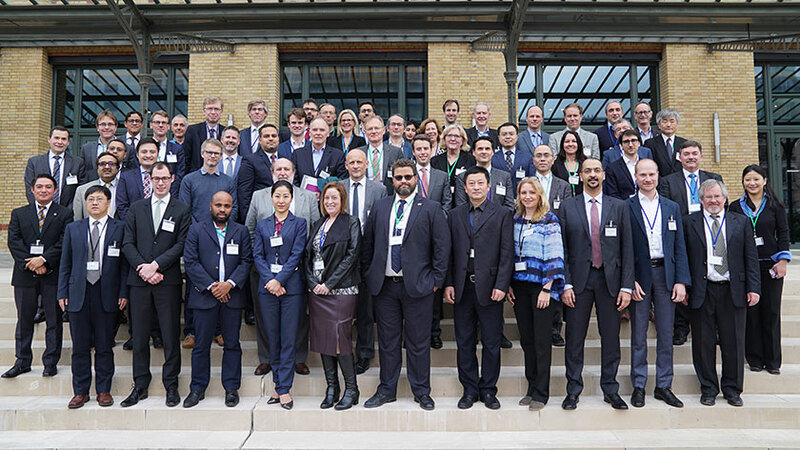 January 31, 2018: The International Energy Agency (IEA) and the King Abdullah Petroleum Studies and Research Center (KAPSARC) co-hosted an expert workshop in Paris on the potential for advanced CO2 enhanced oil recovery (CO2-EOR) to decarbonize oil production. Vanessa Nuñez-López discussed Net Carbon Negative Oil (NCNO) and its relation to the lifecycle analysis of carbon. January 30-31, 2018: A little over one hundred researchers and industry experts who work on carbon capture and storage assembled at The University of Texas to share knowledge and discuss emerging technologies during UTCCS-4. 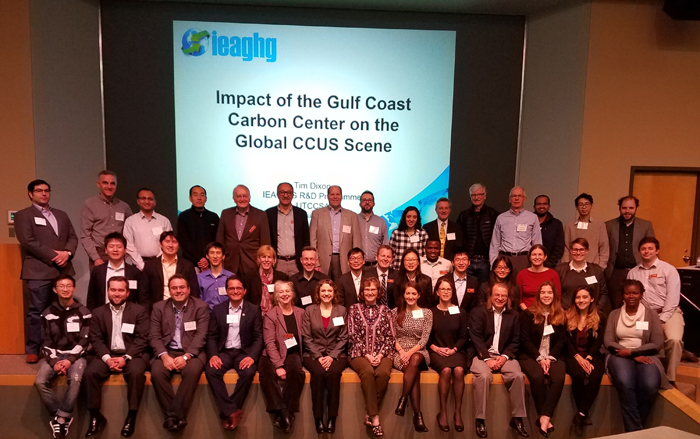 This bi-annual event, in its fourth iteration, was presented by the Gulf Coast Carbon Center, the Center for Frontiers of Subsurface Energy Security, and the Texas Carbon Management Program. 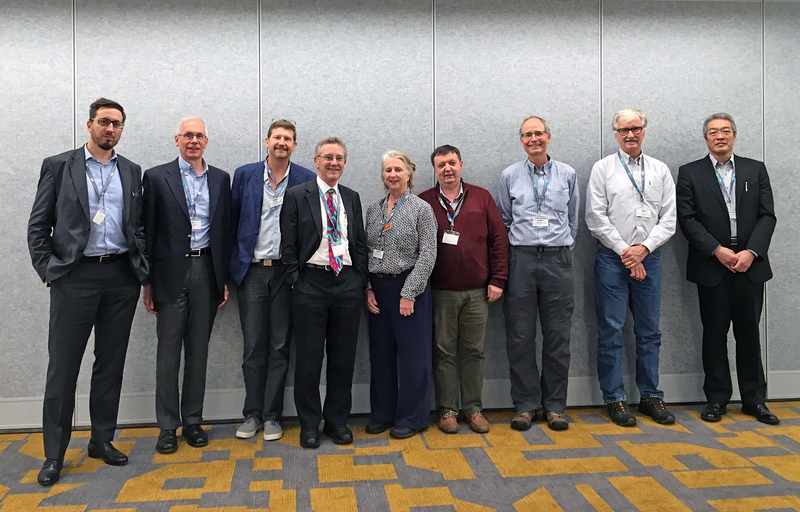 Plenary talks were given by Howard Herzog, from MIT's Energy Initiative, who put CCU and negative emissions in perspective, and by IEAGHG's Tim Dixon, who used the opportunity to share the impact of GCCC on the field of CCS in a global context. The meeting included four major areas of focus. A carbon capture track was facilitated by Gary Rochelle of the Texas Carbon Management Program. A carbon storage research track focused on basic science results from the CFSES program and was led by Larry Lake. The Gulf Coast Carbon Center led a track Tuesday morning on their new CarbonSAFE project. And GCCC led tracks on Tuesday afternoon and Wednesday morning showcasing general GCCC achievements over the last four years. Wednesday afternoon was reserved for a GCCC sponsors-only meeting hosted at the Bureau of Economic Geology. January 30, 2018: Congratulations to Pooneh Hosseininoosheri who won the “Hildebrand Department of Petroleum and Geosystems Engineering Research Award” for her poster "CO2-EOR/Storage: How black turns to green" at GAIN 2018. The annual event hosted by the Graduate Engineering Council at The University of Texas at Austin is a broad networking opportunity that allows The Cockrell School of Engineering to showcase its best and brightest graduate students. 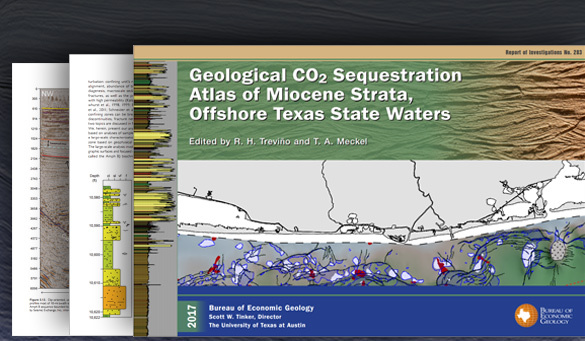 January 19, 2018: GCCC is delighted to announce the publication of eological CO2 Sequestration Atlas of Miocene Strata, Offshore Texas State Waters, edited by Ramon Trevino and Tip Meckel. 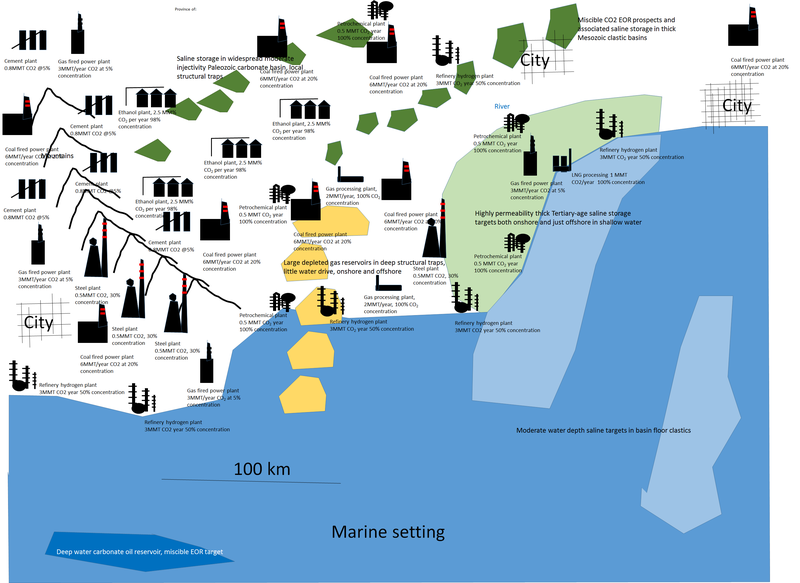 The Atlas summarizes research undertaken as part of a multiyear study (2009–2014) of Texas State Waters and the adjacent Federal Offshore Continental Shelf. 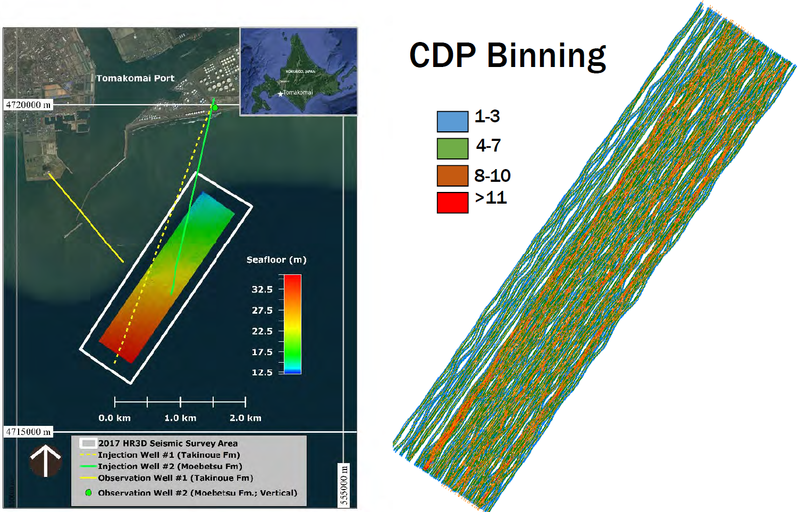 It provides a resource for exploring the geological CO2 sequestration potential of the near-offshore waters of Texas via large-scale regional and qualitative, as well as detailed quantitative, information that can help operators quickly assess CO2 sequestration potential at specific sites. This is the first comprehensive attempt to accomplish this goal in the near offshore Gulf Coast and United States. For more information, please click here. To purchase a copy, please follow this link.